Whenever Aditi and I head over to Southgate Mall, we pass CinnZeo in the food court, and we have the same dialogue practically every time. Aditi: Mommy, I smell something good and delicious. Me: Oh, what's that then? Aditi: Its all nice and warm and cinnamony. Aditi: Its brown and soft and sweet. Aditi: Its tasty tasty good. Aditi: Mommyyyy... you're so mean, we passed the cinnamon bun place already... waaaahhhh!! Me (very insincerely): Oh, sweetie, what a shame, maybe we can make some buns at home instead. Yeah, that's me and my daughter. Aditi loves cinnamon buns, and well, so do I, but not when one bun furnishes the entire day's worth of calories and sugar at once. If Aditi and I are lucky (or exceptionally smart), we pass Cinnabon when they're doing their little sample hand outs. We love that, and both have a piece, and that's my craving sated for a day at least. But for the last few days, Aditi has been pestering me to make some cinnamon buns, especially since I made her a small one from leftover dough from my hamburger rolls. So I figured, why not, and dug out a recipe that was given to me by my dear MIL. This recipe has shortening in it, and I never made it when I was in England, as we couldn't manage to get shortening there. I tried it once with suet, but it didn't work out, so I relied on this Easy Living recipe instead. The buns were good, but not spectacularly great, so I never made them a lot. Anyway, I decided it was time to pull out MIL's recipe for roll dough (she told me she got it from the Better Homes and Gardens Cookbook, she's not sure which edition though) The recipe is for plain roll dough, that you would use to make hamburger and hot dog rolls, but is made a little richer with the addition of extra shortening and sugar to use for cinnamon buns. 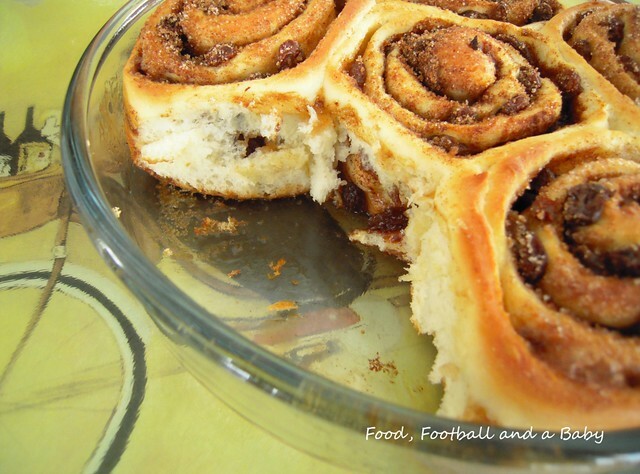 I was very impressed by the quality and taste of these buns, and they were so simple to make, especially if you have a bread maker to take the hassle out of making the dough. MIL said that pretty much everything she'd tried from that book had turned out exceptionally well, so I have another book of recipes to copy off her now. This recipe makes double the dough needed for the buns. You can just double up on the buns or make plain rolls with the rest of the dough, if you like. 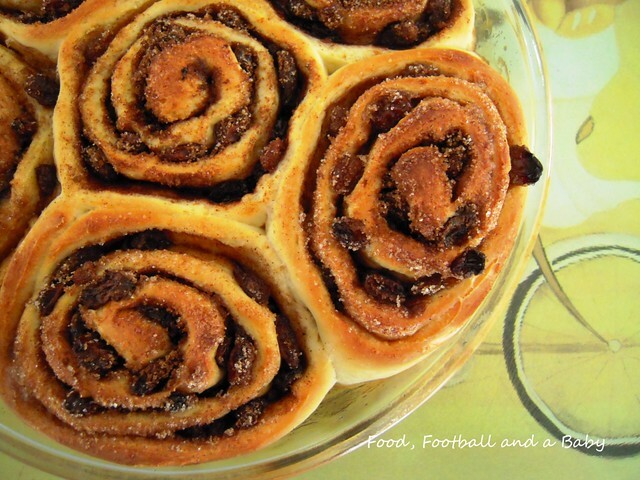 I also added raisins to the buns, as I quite like the textures. You can add them or leave them out, and you can also use crushed walnuts or pecans as the filling. Once the buns are out of the oven, you can glaze them with a dark sugar syrup or ice them with cream cheese frosting, but I didn't bother with that, as I felt the buns were pretty delicious on their own. Soften active dry yeast in warm water. Combine milk, sugar, shortening and salt; cool to lukewarm. Add 1 cup of the flour and beat well. Beat in softened yeast and egg. Gradually add the remaining flour to form soft dough, adding a little more warm water if required. Turn out on lightly floured surface and knead for a few minutes. 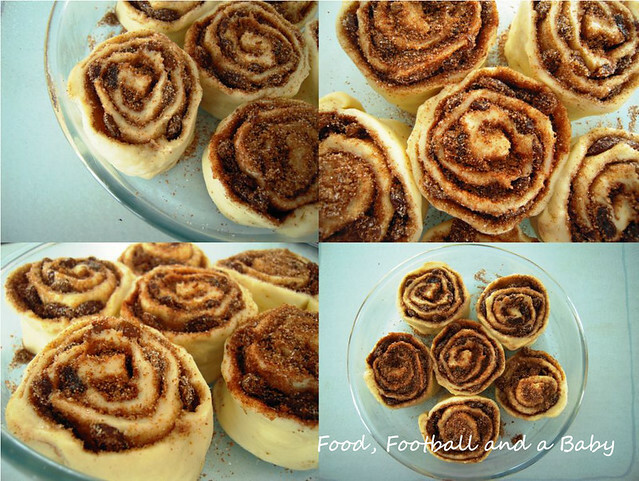 Then make cinnamon buns, as noted below. Note: For a richer version, increase either the shortening or sugar or both to ½ cup. On lightly floured surface roll ½ of the plain roll dough to a rectangle. 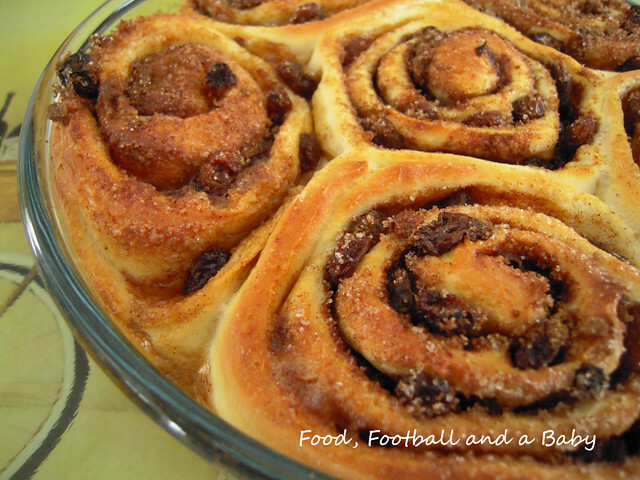 Combine ½ cup brown or white sugar, ¼ cup melted butter, and 1½ teaspoons cinnamon, spread over dough. Sprinkle with ¼ cup raisins and/or chopped walnuts or pecans. Roll lengthwise, as for jellyroll. Seal edge, then, using a very sharp knife, cut into 1-inch slices. Place cut sides down in greased pan and leave in a warm place and let rise again till double in size. Bake in moderate oven 350 F for 15 to 20 minutes. Frost with confectioners’ icing if desired. Note: This only uses half the plain dough recipe. You can make plain rolls or buns with the rest. Shape and place into greased pan - let rise until double and bake. Do visit their blogs, some amazing treats on offer. Your rolls look really soft! That's just too funny. Surely it's not possible to still want Cinnabon's rolls after eating yours. Lisa, its the smell of those damn things :-) We just can't go to the mall without smelling them a mile away. Hehe mean mommy! But Im glad Aditi has a nice mommy who came home & made some of her fav goodies for her :) I'd never do that..haha! 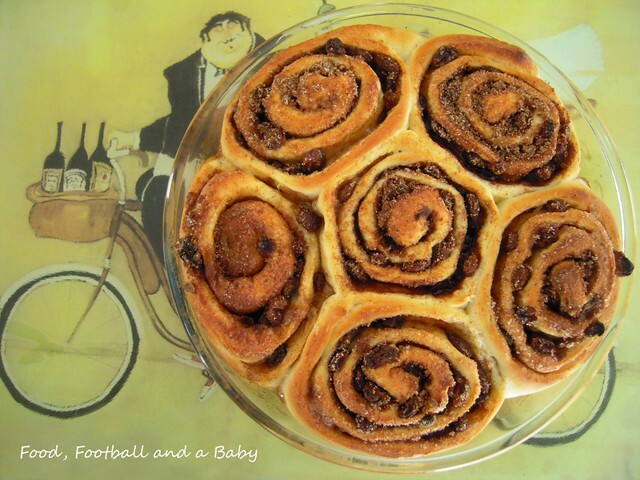 This one is going on my to-do list - have never tasted cinnamon buns till date, im sure they are irresistible! These look super delicious. Everyone seems to be posting about cinnamon buns at the moment and my craving is growing fast. I've never had a home made one before. I guess I'm just going to have to make some for myself. Thanks for linking this up to Sweets for a Saturday. You're such a loyal linker and I love it! Haha, gotta love little girls. These look great. Oh my! They look like pretty roses! Fattening, but oh so pretty-and yummy:@) I have to make some soon! What a nice treat :) Sweet post, what a nice mom! These look just like the one my mom made when I was a kid. Yum. Thanks for sharing your recipe. These are beautiful! I don't make cinnamon rolls often enough, but they are the best thing to wake up to on a Saturday morning. @Choclette, you totally won't regret it, they are pretty delicious. @Dom, yup, the smell alone causes me to put on those additional pounds... they're worth it though. @Melissa, you got that right... your Annabella is so cute... she's going to be three soon, if I have my maths right? Its an amazing age, wish I could keep my Aditi this age forever. @Lynn, thanks :-) Its a treat, but its so nice to have treats once in a while eh? @Carol, thanks... I try to be a nice mom most of the time, but Aditi has seen the mean mommy side too... I hope that the ncie mom bit outweighs the mean mommy bit... its lovely being with her though, and I wish the time would never end. @Carolina, thanks, that's such a nice compliment. I love your blog, its so unique. @Allison, I linked up... and you're totally right, its an amazing aroma to wake up to. Just FYI, you can use white flora in the UK, which is the same as Crisco shortening in Canada.